Fake Switch Pro Controllers – How do they compare and what’s inside? Meet the counterfeit controller that's $40 cheaper than Nintendo's. 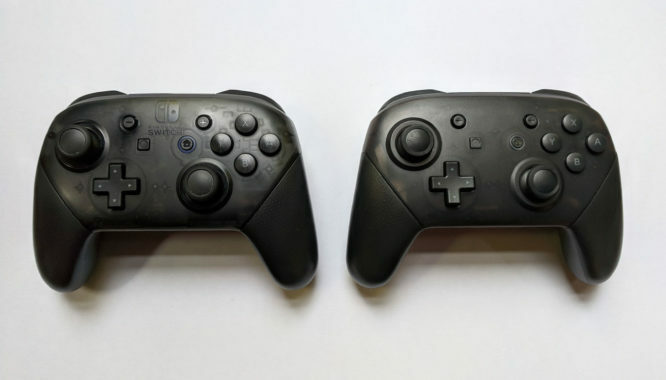 Pictured above is an official Nintendo Switch Pro Controller nestled beside its counterfeit counterpart. At first glance, there isn’t much between them, stamp a logo on the fake and you’d have a hard time telling them apart. In fact, that’s exactly what happened with the Wii U Pro Controller and branded knock-offs soon flooded the market. Aesthetically, the bootleg controller is a near-perfect match to the original. All the buttons are in the right places, it uses similar materials, and is the same shape/size. The factory that produced these clearly had access to (or somehow cloned) the moulds used by Nintendo. The missing logos, slightly less transparent front, and plus/minus buttons that protrude a few millimetres further are the only external differences. Thanks to the semi-transparent back you can also grab a peek at the internal battery, which bears a slightly different wrap to the original. All of which could easily be missed if you didn’t have an official controller to compare it to. 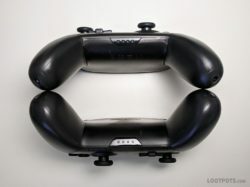 Despite their similarities, there are some major differences between the two controllers, and one of them is the price! I picked up the fake for a measly $24 (£18) on AliExpress, that’s $40 less than the official Nintendo version. Three weeks (and a short boat trip) later, the knock-off Pro Controller finally arrived at its new home. I welcomed it in with open arms, plugged in the charging cable, and placed it back outside in case it exploded. While it was charging I decided to check out the packaging. In true knock-off fashion, the fake controller came in a box reminiscent of its official counterpart. They even threw in a charging cable, which was nice. Printed on the rear of the box was a list of controller features, something I wasn’t expecting, as the seller never claimed it did any of them. and more (I still have no idea, buttons?). The packaging also trumpeted a battery 20-hour battery life and PC compatibility. If all of these were true then I’d just hit the morally-questionable jackpot. They wouldn’t just print lies on the box, would they? What can a fake Switch Pro Controller actually do? Just like an official model, the knock-off emitted a little orange glow from the top LED while it charged. When it finally faded, I knew it was time to unplug the controller and find out what it could really do. At least the battery didn’t explode, which is reassuring. Syncing the controller up was the first hurdle – while it does work on 5.1.0, the little sync button on the top just turns the controller off. Flipping through the flimsy manual revealed that sync mode is triggered by holding the Home + Y buttons for three seconds. Not ideal, but not a complete deal breaker either. The Switch OS recognises the fake as an official Nintendo Switch Pro Controller, little icon and all. It re-connects using the Home button and has roughly the same Bluetooth range as the original controller too. The LED indicators at the bottom of the controller flash and light up correctly. However, unlike the official controller, the knock-off has a timed standby mode built-in. While Nintendo’s Pro Controller stays connected until the console goes to sleep, the fake will automatically turn off after about 6 minutes with no input. Although this saves battery, if not used, the controller will automatically disconnect before the Nintendo Switch enters sleep mode. When the Switch console does enter sleep mode, the fake Pro Controller isn’t able to wake the system up. Pressing the home button simply causes the indicator lights on the controller to flash sequentially. The Nintendo Switch console needs to be woken up using another method before the fake controller will reconnect. In comparison, the official Nintendo Switch Pro Controller can wake the system up from sleep mode (which is super useful). Overall, the various inputs on the fake Pro Controller give Nintendo’s model a good run for the money. The ABXY buttons are slightly stiffer on the bootleg controller, while the trigger buttons are a little bit softer. There wasn’t any noticeable input lag on the Switch and if I didn’t know otherwise, I’d assume I was playing with the real deal. Close up of fake controller’s inputs. When it comes to the analog sticks though, the difference is quite noticeable. Despite responding well, they simply aren’t as smooth as the Nintendo’s Pro Controller. There is a slight grind when circling the stick around the plastic rim and the rubber grips are a bit rougher/unrefined. The left stick was also scratched straight from the get-go. Unfortunately, the D-pad suffers from the same design flaws as the official controller. Pressing a D-pad button and rocking lightly in another direction causes the controller to pick up the neighbouring input. I’d go as far as saying it’s slightly worse on the knock-off. A complete nightmare in games that require precise inputs. Who’d of thunk it, the box lied. While I wasn’t expecting HD rumble, it definitely would have been a nice surprise. Instead, the fake Switch Pro Controller comes with two standard rumble motors, similar to those found under the Xbox One’s triggers. Rumble motor with foam padding. At the risk of spoiling the teardown section – both motors are just wedged into the handles’ HD rumble compartments with bits of foam. They’re pretty noisy when they get going and vibrate quite dramatically in games like Mario Kart 8 Deluxe. The fake definitely falls short in the rumble department. Naughty box! Yes, this thing actually has motion sensors built in! After getting over the initial shock, I grabbed a bunch of compatible Switch games and began some crude testing. Switching between the two controllers in Breath of the Wild, Mario Kart 8 Deluxe, and Splatoon 2; there was no noticeable difference. The bootleg’s built-in motion controls responded just as well as the genuine controller’s. Colour me impressed! Error message when using amiibo. The built-in amiibo functionality was simply just another lie printed on the box. I’ve played over 12 hours using the fake Pro Controller so far and the battery hasn’t been drained yet. Oddly, the controller menu in the Nintendo Switch’s OS still reports that the battery is 100% full, which simply cannot be true. I suspect that at some point the fake Pro Controller will drop from 100% to 0%, or simply just disconnect without warning. I’ll update this article when the controller finally runs out of juice. Hooking the fake controller up to my PC went relatively well. Using a wired connection, the controller was picked up by Windows as an Xbox controller and worked perfectly well. Motion controls are unfortunately off the table using this method though. Switching to Bluetooth, Steam recognised the fake as an official Switch Pro Controller and allowed me to go through the usual Switch Pro Controller configuration menus. A few minutes later, I was playing Portal 2 using the controller’s built-in motion controls. Not bad for a cheap and cheerful gamepad! What’s inside a knock-off Switch Pro Controller? Given the accuracy of the shell, I was half-expecting the internals to be factory seconds of the original. However, once you see inside, it becomes immediately obvious that the fake controller isn’t the same at all. 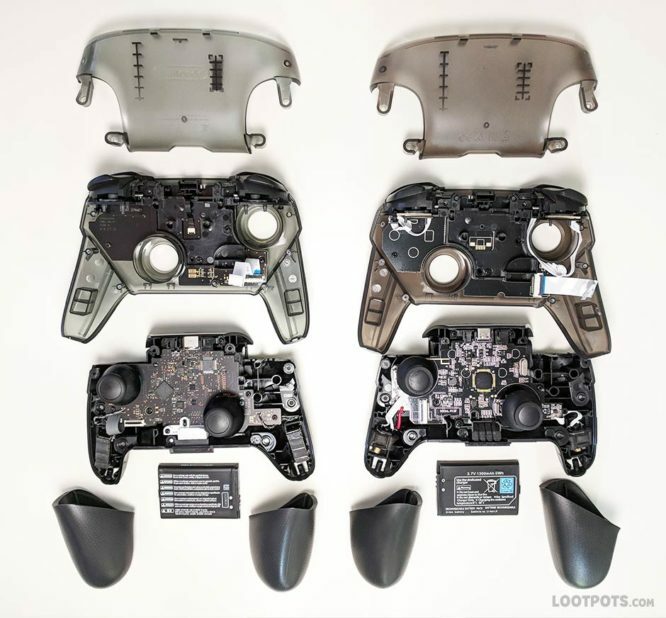 Although the PCBs are cut to fit the pro controller shape and the inputs are positioned correctly, nearly every other internal component is completely different. Front PCB of fake controller. Rather than neatly feeding the trigger buttons through a single flat flex cable in the front section, the fake opts for multiple garish white wires, that on one side, loops the whole way around the analog stick. The triggers are then crudely soldered directly to the front plate’s PCB. The same white wire can be found, accompanied by a dollop of glue, on the bottom corners of the main board. 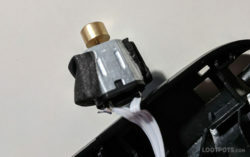 These are used to connect the two definitely-not-HD rumble motors, which are simply wedged in place using some foam padding. An unbranded analogue stick found inside the fake Pro Controller. Removing the analogue stick caps reveals that the Nintendo’s Switch Pro Controller uses two ALPS RKJXV1224005 analogue stick modules, similar to those found in PS4 controllers. The fake controller uses two unbranded modules that, despite operating the same, have some minor differences. The shafts of the fake’s sticks are made of metal instead of plastic resin. It also uses a long bar for the click functionality, in contrast, the ALPS modules use a smaller plastic block to active the click input. Fake Pro Controller’s Main PCB. It’s no surprise that amiibo communication failed, in place of STMicroelectronics’ NFC controller chip, the fake simply has… nothing! That’d explain it. The knock-off controller does have Bluetooth though, albeit a completely different chip. Nintendo uses a Broadcom BCM20734UA1, the knock-off instead opts for the smaller RDA5876 Bluetooth & FM Radio Tuner from RDA Microelectronics. You still can’t listen to the radio though. While the fake pro controller does have a motion sensor built-in, I wasn’t able to identify the actual component they were using. Nintendo’s official Switch controllers (Joy-Con too) all seem to have tiny STMicroelectronics 6-axis inertial sensors installed. Tucked behind the main board, is a smaller PCB that connects the battery to the controller’s main PCB. The official Switch Pro Controller does this using a grey ribbon cable (containing four wires); the fake uses two thicker wires instead (positive and negative). The battery connection pins also differ, with Nintendo using three double pins and the fake using three single pins. The battery in the fake Pro Controller is labelled up as 1300mAh, 3.7V lithium-ion battery. Although it may have the same specifications printed on it official Pro Controller battery, it certainly isn’t one. The warnings are printed on the wrong side and it lacks the Nintendo logo and CTR-003 part number (yes, the official controller uses a 3DS battery). The knock-off battery weighs a few grams less than the official one and is also slightly longer (by less than a millimetre). Swapping the batteries over also showed that both the fake and genuine batteries seemed to work fine in either controller – although I wouldn’t recommend doing this. Once the knock-off battery is finally drained, I’ll be able to test its true capacity and update this article accordingly. Until then, it gets the benefit of the doubt. The fake Pro Controller performs surprisingly well considering its low cost. While it won’t be replacing my official one any time soon, it does make a useful backup or “Player 2” controller. Compared to an official model, the build quality isn’t quite up-to-scratch and there’s no NFC chip inside either. However, if it weren’t for the patent-infringing design, it’d make a decent third party controller.